I could just use a 7 period but it would be off a little for what I was attempting to do. Only a little, I think. It certainly shouldn’t be so different as to make the method unprofitable rather than profitable. Another possibility might be to try a 6-period [I]exponential[/I] or [I]weighted[/I] MA as the “faster” line and a 6-period [I]simple[/I] MA as the “slower” one. I haven’t actually tried it, but I’d think that would also be pretty similar? The ribbon is formed from a combination of a normal MVA and the same MVA shifted forward +1. It is this “shift” indicator that no longer appears on the Trading Station (although it can still be found as a custom ind). But if it cannot be found then the Alligator indicator contains shift settings and can be adapted to replicate exactly the same result. In the Ribbon pdf, the ribbon used is based on two 6-period MVA where one is shifted +1 bar. But the same principle can be used with any kind of line, turning it into a ribbon, and for this reason the availability of the “shift” indicator would be useful for both Web and PC versions. What I was looking to do is on the first post of that thread. In the post they have 2 6 period moving averages 1 is set to 6-0 which I assume is just a 6 period moving average but the other is set to 6-1 which appears to be a 6 period moving average but it lags current price by 1 period. I could just use a 7 period but it would be off a little for what I was attempting to do. Was going to develop a scalping strategy using a similar concept. I am also following up with our Trading Station developers and will let you know if they respond back with other alternatives for you. One of my favorite new features is the Simulation Mode. This allows you to replay market data at real or accelerated speed (for example, 10 times real speed). The best part is that Simulation Mode is available 24/7 even during weekend maintenance. This is great for traders who like to do their charting, practicing and strategizing over the weekend when trading is closed. Test how well you would have traded key market moves from the past! Thanks, Jason, for the notice! I tried the Simulator and it is very useful! The fact that you can replay actual market movements at fast-forward and then manually pause it to enter and exit trades according to one’s trading strategy, and see the effects on the simulation’s P/L is brilliant! 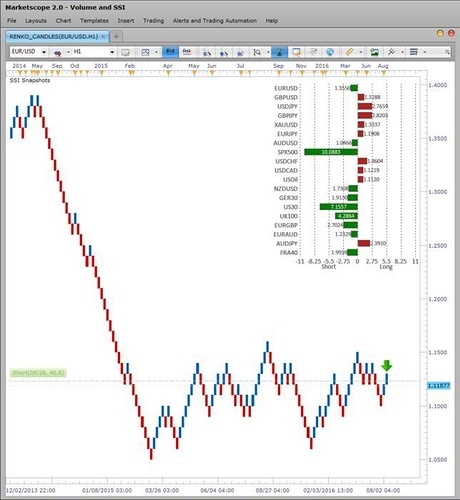 Not only is it great for testing strategies, but it is a superb way of learning to trade “hands-on” - similar to a demo account but with up to 10x the speed, which means one can rerun the same periods over and over whilst optimising a strategy. …and brilliant that these can be run over the weekend whilst markets are closed and there is time to concentrate of checking and developing one’s strategies - thank you FXCM for this! It would be nice if FXCM could also offer some better templates for setting up parameters for automated backtesting on the Simulator as well. The available ones at present seem quite basic - or have I simply not found them? Thank you both for your feedback on the new Simulation Mode on Trading Station! I’m sharing it with our developers and will let you know their response to your comments and questions. In future posts, I willl provide you with more information on other new features available in the latest version of Trading Station Desktop. 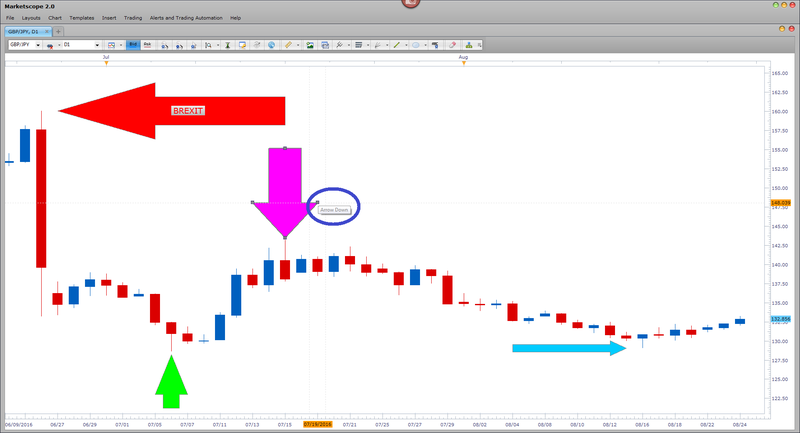 With the recent Trading Station Desktop update, you can now draw arrows on your Marketscope charts. [/li][li]Select Add Tool from the pop-up menu. [/li][li]Select Arrow Up, Down, Left or Right. [/li][li]Customize your arrow color and other setings in the Properties window and click OK.
[li]You can change the shape of an arrow by first left-clicking on it to select it, and then left-clicking and dragging on one of the 4 points that appears in the outline. [/li][li]You can modify or delete an arrow by right-clicking on it and selecting Change or Remove from the pop-up menu. Please let me know if you have any questions or comments on the new features added to Trading Station Desktop. Our service includes products that are traded on margin and carry a risk of losses in excess of your deposited funds. The products may not be suitable for all investors. Please ensure that you fully understand the risks involved. You can set stops and limits in Simulation Mode just as you can in real time. Since you live in the US, your account must set stops and limits in a FIFO-compliant manner. That means you can net stops and limits (as opposed to attaching stops and limits to individual tickets as you can with FXCM UK accounts) and these will appear in the Orders window. Is there a way to get an older version of the Trading Station software? Unfortunately when I updated this morning and opened my charts, the program continually crashed. I found out (or at least it appears) its due to Renko charts. I use that primarily for trading and now am kind of dead in the water. Try starting with the default chart layout. In the menu bar at top right of your Marketscope charts window, go to Layouts > Default Layout. 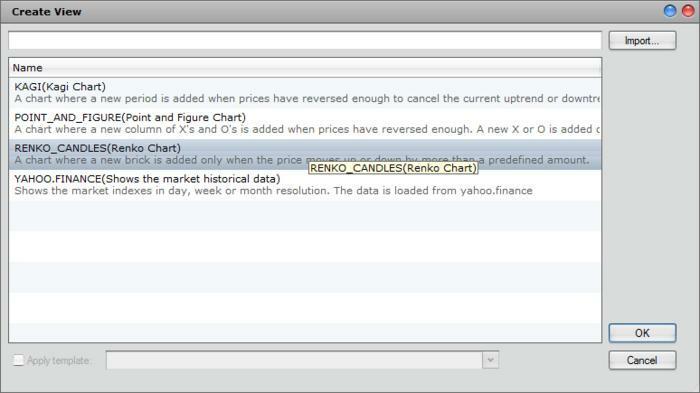 If that loads for you without crashing, then to to File > Create View to load a new Renko chart. If you still have difficulty, please send me a private message with your contact details and the best time for our tech support team to give you a follow up call. Then we can investigate this problem for you in more detail. Actually I received an email from someone at FXCM last night and sent me some instructions. Afterwards it all worked again! I think what was locking it up was the combo of Renko with an indicator like an EMA on top of it. Either way it works again and am happy ) Looking forward to trying out the simulation mode! I’m glad my colleague was able to help you resolve that issue! And yes, please let me know what you think of the new features we added to Trading Station Desktop. Hi Jason, how do I load Renko charts? In the Marketscope window of Trading Station Desktop, go to File > Create View from the menu bar at the top right. Please note there is a [B]holiday in the US on Monday, September 5th for Labor Day[/B]. [ul][li]You can see our holiday trading hours for CFD’s here: What are the CFD Holiday Hours? For immediate assistance, you can contact our 24-hour live customer support. To my fellow traders in the US celebrating Labor Day, I hope you enjoy the holiday weekend! I am trying to use the Simulation Mode to backtest a daily strategy, is there anyway I can skip a whole daily bar at a time at the click of the mouse, rather than having to wait for it to completely form?